Form OW-8-ES or the "Oklahoma Individual Estimated Tax" is a form issued by the Oklahoma Tax Commission. The form was last revised in May 1, 2017 and is available for digital filing. 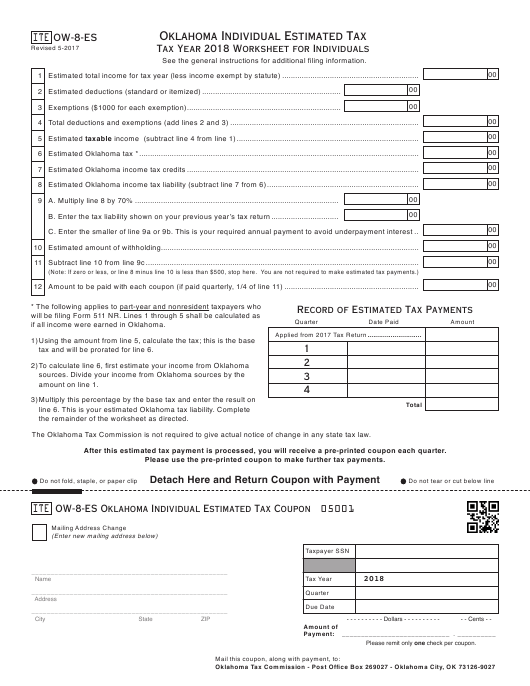 Download an up-to-date fillable Form OW-8-ES in PDF-format down below or look it up on the Oklahoma Tax Commission Forms website. See	the	general	instructions	for	additional	filing	information. C. Enter the smaller of line 9a or 9b. This is your required annual payment to avoid underpayment interest ..
if all income were earned in Oklahoma. tax and will be prorated for line 6.
the remainder of the worksheet as directed. The Oklahoma Tax Commission is not required to give actual notice of change in any state tax law. After this estimated tax payment is processed, you will receive a pre-printed coupon each quarter. Please use the pre-printed coupon to make further tax payments. Please remit only one check per coupon. included	with	Packet	511	or	Packet	511NR	instructions. Name and Address: Enter your name and mailing address. • On a joint return, enter the name of the primary taxpayer. taxable year of 12 months. entered	first	on	the	income	tax	return. in the upper left corner of the coupon. Taxpayer SSN:	Enter	the	primary	taxpayer’s	social	security	number. OW-8-ES-SUP	may	be	downloaded	at	www.tax.ok.gov. paid with the estimated tax coupon. Do not send coupon if no payment is required. Make checks payable to: Oklahoma Tax Commission. See below for electronic payment information. Commission’s	Taxpayer	Assistance	Division	at	(405)	521-3160.
for utilizing some of the electronic payment services. due the next business day.